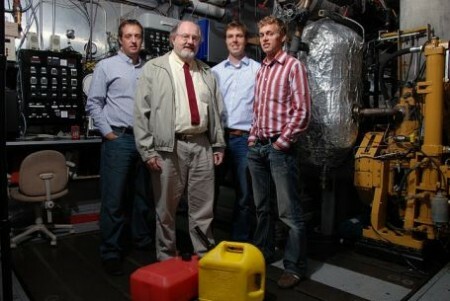 An award-winning University of Wisconsin-Madison team led by professor Rolf Reitz will showcase at the Wisconsin State Fair a student hybrid vehicle for advanced fuel technology that harnesses the advantages of both diesel and gasoline. The fuels are mixed in the combustion process. Now this is something serious to watch. The UW-Madison Hybrid Vehicle Team has placed first in the U.S. Department of Energy’s Advanced Vehicle Competition six times in the past 20 years. The new fueling idea is so good the team is taking a break from the competition to work on the new idea in conjunction with the UW-Madison Engine Research Center. RCCI Engine Test Cell. Click image for more info. The process is called reactivity-controlled compression ignition or RCCI. The process involves two separate fuel injections: First, gasoline is swept into the engine with fresh air, with which it’s mixed uniformly. Then diesel fuel is injected, dispersed finely enough that it ignites under compression. It sounds completely normal, except that the RCCI engine can achieve efficiencies of between 20 and 35 percent better than standard diesel engines, which are themselves about 20 to 30 percent more efficient than gasoline engines. This is a major fuel extender technology. Its also projected the engines will emit 75 percent fewer greenhouse gases. It’s also strongly motivating. 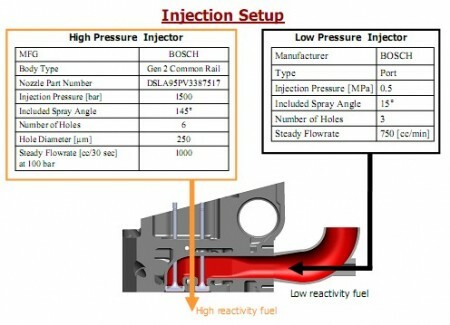 RCCI Experimental Injection Setup. Click image for the largest view. Mixing the two fuels allows combustion to take place at lower temperatures, which both reduces how much energy is required in just keeping the engine optimally warm and the amount lost overboard, and minimizes the production of nitric oxides, the chemical of smog, one of the biggest problems in vehicle-related air pollution. The most interesting effect is the technology also reduces hard carbon emissions. Because the process involves pulling in fresh air, more so than standard combustion, the leftover carbon is more likely to react with oxygen to form carbon dioxide, rather than being expelled as hard soot. Glenn Bower, a mechanical engineering faculty associate and UW vehicle team advisor said, “Everyone (atoms) finds a dancing partner, so we don’t get solid carbon coming out. The air coming out is as clean as the air in Wisconsin.” This is very good news as soot is one of the most problematic human health effluents that engines release. EPA emission standards for diesels have and will cause higher costs both in manufacture and operations. Using RCCI, Bower estimates the team vehicles will emit 75 percent fewer greenhouse gases, surpassing the 2010 vehicle emission standards with minimal after treatment. This is news to cheer up everyone with heavy duty diesel engines in their equipment inventory. Bower also mentions RCCI engines can achieve efficiencies of between 20 and 35 percent better than with standard diesel engines, which are themselves about 20 to 30 percent more efficient than gasoline engines. That’s closing in on about 40% efficiency. This is about double a typical gasoline engine. The mixed fuel automobile looks pretty attractive at a doubled mileage. This is before going to biofuels. Bower’s team is going to use ethanol instead of gasoline, and biodiesel instead of standard diesel. It will be fascinating to see how that turns out. The team is converting two of its former competition vehicles for tests. The first, a Saturn Vue called the eMOOve, will be a series hybrid, to be completed in 2012. A series hybrid is an electric vehicle with an on-board generator: the generator operates at one speed, and therefore requires calculating only one ideal fuel mixture. By 2013, the team will also convert its Chevy Equinox, called MOOVADA, to be a parallel hybrid, in which the battery and the engine work together. This will take more work because the engine must operate smoothly across all different engine speeds and loads. Bower says he hopes incorporating the RCCI engine technology into a vehicle will encourage industry leaders to adapt it for vehicles and even stationary power generators. Here’s the glitch for growth – the fuel infrastructure, just as with ethanol mixes past the blend ratios that are done before the delivery to the gas station. For blending at the station much more complex pumps are needed. In order to fuel an RCCI engine, a gas station pump must be able to dispense both gasoline or ethanol, and diesel or biodiesel, simultaneously. This is a major change – but doubling the efficiency of the gasoline engine would be worth it. This team’s idea deserves serious attention, if only for a few decades use, the extension of biomass or petroleum fuels will reduce fuels cost share of the economy allowing investment into other fields. There is good reason to think that overall vehicle costs would decline. More manufacturing and construction would be needed. The economy could use a growth shot. If the team’s engines can pull a 30% efficient diesel up to 40% and drivability is as good or better than a gasoline engine, the value is very high. Built small, used in a series hybrid, the fuel extension would be even greater. I don’t understand why a fueling station would have to dispense both fuels at the same time. Just fill the tanks one after the other. That puzzled me too. One expects the university writer to be correct, but it maybe a misunderstanding. There isn’t an obvious need to fill simultaneously. What would be needed is separate nozzles to keep the fuels apart until they meet in combustion. Does it work in big slow speed stuff like ship diesel? How about locomotive diesel? These users have huge fuel costs and can quickly recoup retrofit costs. It is still spewing carbon and using almost depleted oil. Scientific American says peak 2014. GreenGas.cc is 50 cents a liter and zero emissions. Engine is very important part of an automobile. In present time many research is going on engine to get maximum mileage and power at minimum cost. An alternative fuel is also required to run an engine because higher cost and low availability of petroleum fuel (diesel and petrol). Many engines have developed which can run on an alternative fuel; one of them is a duel fuel engine. CNG and LPG fuel engines which are used in now days are duel fuel engine. Duel fuel engine are used because of high cost of diesel.